Looking to jump-start your GPA? Most college students believe straight As can be achieved only through cramming and painful all-nighters at the library. 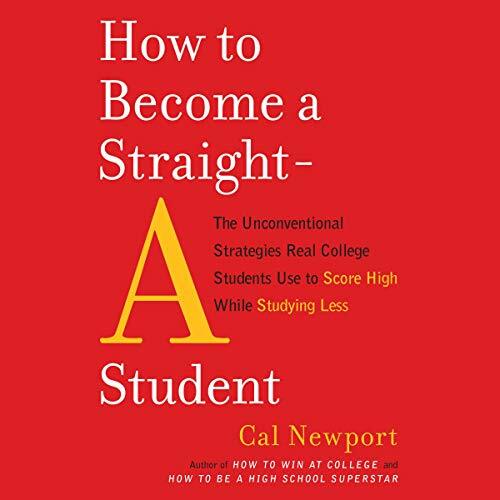 But Cal Newport knows that real straight-A students don’t study harder - they study smarter. This book had more information for the length of time than most self-help books out there. Narrator is good and the content is good. However, he often references images in the book that I really wish I could see. This is my first audible book, so maybe I'm missing some way to view these (description also says it comes with a PDF guide, but I don't see it anywhere), I would definitely get the paper book though . I'm not a student, but I wish this book was around when I was. Cal's arguments are composed, lean, and riveting. The Case Studies and variety of specific examples make this text stand out. I'm an executive who always needs to write and study, and I found a plethora of applicable steps. I'm a nursing student and this seemed geared more towards liberal arts or math majors. not so much nursing. still a very good and useful book. valuable information for habits and life. worth the buy.